With Symbolic, Death, or rather Chuck Schuldiner, already delivers a sixth album. The disputed character of the man has been little more than an afterthought for years now, due to the quality albums he makes with clock-like regularity. For Death in 1995 it’s new rounds, same chances. The words of Patrick Mameli –known from Pestilence in the distant past- buzz through my head as Death’s frontman Chuck Schuldiner calls me. “That voice…”, was how our national death metal genius once described the sound that his arch-rival Chuck Schuldiner brings forth in a conversation. And indeed, in big contrast with the primeavel grunt known on stage and CD, the one that brought the Floridian the nickname “Evil” Chuck, is this man’s syrupy speaking voice. Many times over the past years “that voice” told me how much better the line-up and CD of the moment were compared to the previous Death incarnations. And equally as many times he was right indeed. 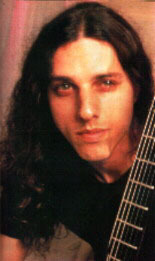 “Evil” Chuck gossiped about co-workers, they gossiped back, he denied, they did as well, he was at odds with everything and everybody (Mameli can’t claim exclusivity in this), he canceled an entire tour, but in the end Chuck Schuldiner will be the one laughing. For the time being, Symbolic leaves every vulture behind in a cloud of dust. Nothing but picked bones are their share.